just about from a to z most of which are USA-made. ​and you'll be sure to see something you'd like for yourself or use as a gift. Seasonal hours are Friday and Saturday May through October 10am - 4pm. Any other time if the store is closed, just ask and I'll be glad to open for you. 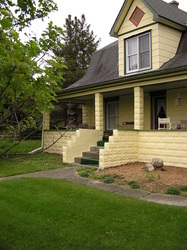 The Crippled Chicken is just west of the small town of Beaverton, Michigan at 3655 Spicer Rd and shares the same location as Nestle Inn Bed & Breakfast. We offer FREE standard/economy shipping on orders of $40 or more to the continental United States. Other shipping options are available. Items are packaged to handle a rough ride (just in case). We aim to ship within three days of receiving an order, but please allow between one to three weeks to receive your item(s). An e-mail will be sent letting you know your package has been shipped. If you have any questions concerning your shipment, please call us at 989-435-8905. All items are sold "as is" and in good working order. Please be sure of the item before purchasing. And keep in mind the majority of the items are used, unless stated otherwise. There will be some old stuff showing some use and/or discoloration. If you have a question about a particular item, please use the "contact form" before purchasing. If you need to return an item, please contact us first by phone or e-mail. The customer would be responsible for return shipment of the item. The item would need to be received in the same condition and packaging as originally shipped. Visit the Crippled Chicken's profile on Pinterest. Q: Why is your shop called the "crippled chicken"? Because of Buddy, a chicken who couldn't use his legs. Find the story here. Q: Do you carry prom dresses? Nope. Beaverton Area hosts a prom dress event every year. Check it out here. Q: Do you take things in on consignment? Yes, but it depends upon what it is. Is it made in the USA? Or at least 20 years old? And is it in workable condition? If it's something you created, what is it? Items need to be clean and in working order. Consignment fees vary as to whether it is a manufactured item or something you created. 989-435-8905.